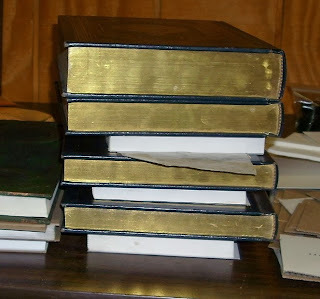 It's been a long time since I posted anything about bookbinding. 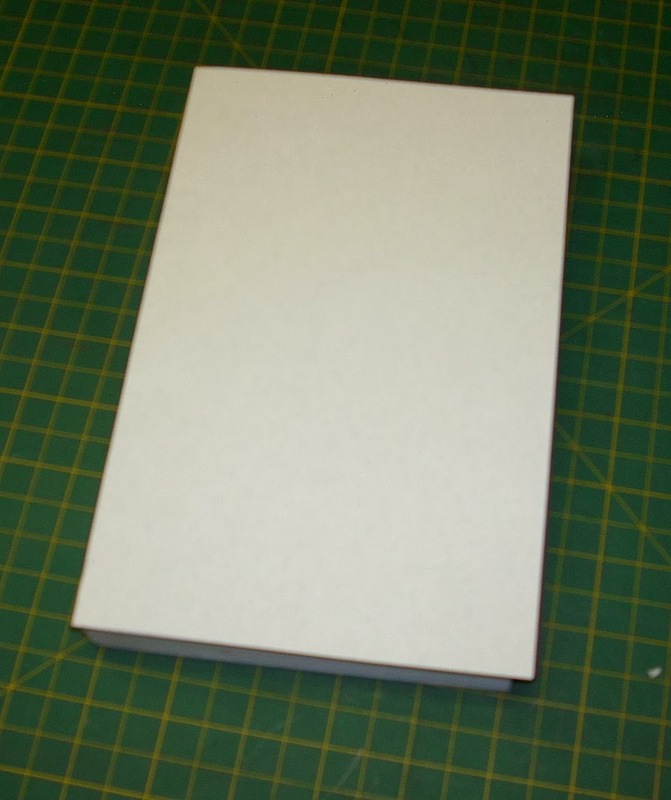 Quite some time ago, I made a post where I described a double end paper technique that I designed to combat the problem of wrinkled end papers when gluing down the mull. I didn't have any pictures of that technique at the time, and several commenters said they would like to see/hear more about that technique. Well, you are in luck! I've been cleaning out my camera folders and I came across some pics of the process, so I decided to do an updated tutorial on building a hard case for a paperback book. 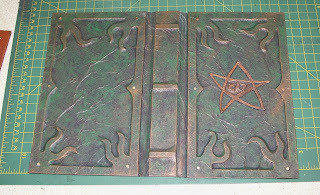 I'll skip the creation of the hard cover and adding the covering material, as that technique has not changed from my earlier posts. I'll jump straight to the double end papers and attaching the mull and the case to the text block. 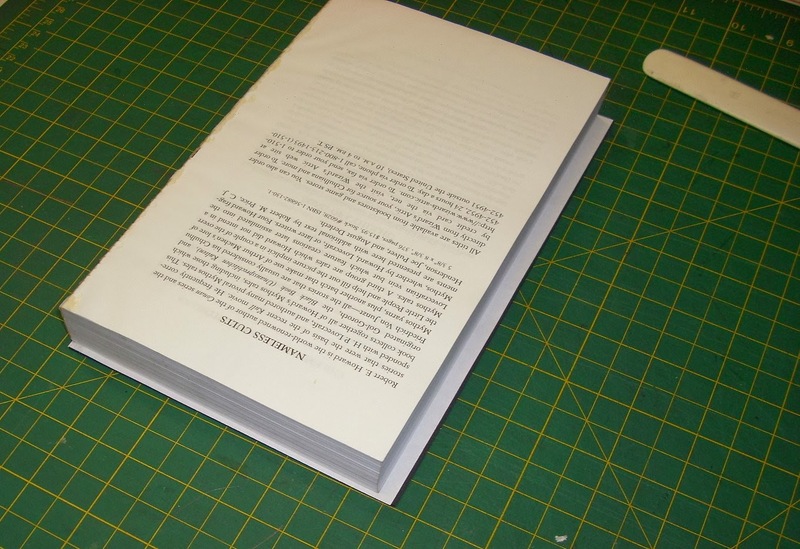 Assume you have your hard case finished and the soft cover has been removed from your paperback book. Now you are ready to case in. Start by selecting two pieces of paper that, when folded, will be slightly larger than you text bock (or at least as large). One should be white (assuming your text block uses white paper) and the other should be whatever you want to use as your end paper. I'm using black for this example. Fold each in half, width-wise. Now take your black paper (or whatever color you are using for your end paper), keeping it folded, and apply a narrow strip of glue along one side of the folded edge. 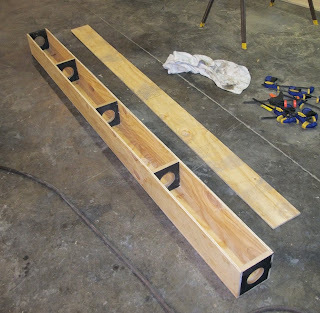 I used to use a dry roll-on adhesive for this step, as it did not require any drying time. But I no longer advocate its use, as I have discovered that it has poor archival qualities. Over time the adhesive can break down. Now I recommend using a very thin coat of pva (white glue). 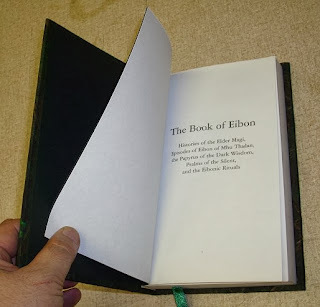 Just take a piece of scrap paper to use as a glue shield and line it up along the folded edge, about a quarter inch from the fold. 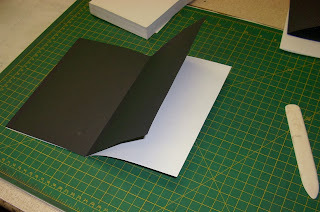 Use a brush to apply a light even coat of glue along the edge of the end paper. This is one of those instances where a very light coat of glue is best. As tempting as it is, don't use your finger to apply the glue. you will almost certainly apply too much. Take the time to use a brush or a foam roller (which you'll be using more of later). Place your folded end paper into the crease of the white paper, like you were making a two page signature. Fold over the white paper to envelope the end paper and smooth down along the fold with a bone folder to ensure good contact with the glue. When you are done, you should have a two page signature glued together at the fold with your end paper being on the inside and the white paper on the outside. Next, you are going to apply glue to the folded edge of the white paper in just the same way as you did to the end paper. 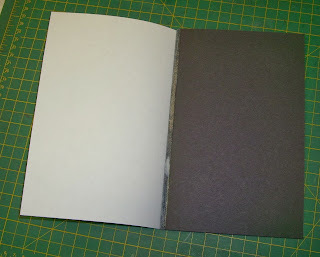 You'll get a nicer finish if you apply your glue along the same side as where the two pages are glued together. Now you are ready to apply your end paper signature to your prepared text block. Line up the folded edge of the signature with the spine edge of the text block. You can let the open edges of the signature overhang the text block if your paper is larger than your text block (which I recommend). It will be trimmed later. Again, use a bone folder to press down on the folded edge to ensure good adhesion. Using your fingers for this can cause smudge marks and wrinkling. I always thought using a bone folder seemed unnecessary whenever I read tutorials that called for it, but I have to say that whenever I use it, I get a nicer finish. You're going to have to make a second end paper signature, just like the first, by repeating the above steps. The second one should be adhered to the back side of the text block in the same way. Then, when both front and back have their signatures glued in place, you should put it under weight to dry. 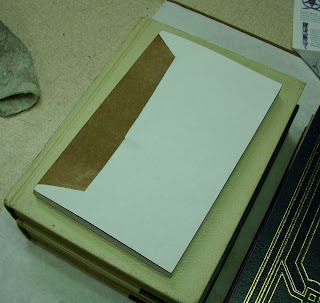 You can even add a page of blotter paper to soak up any excess moisture from the glue (in case you put it on too heavy) to ensure you don't get any wrinkling along the spine edge. 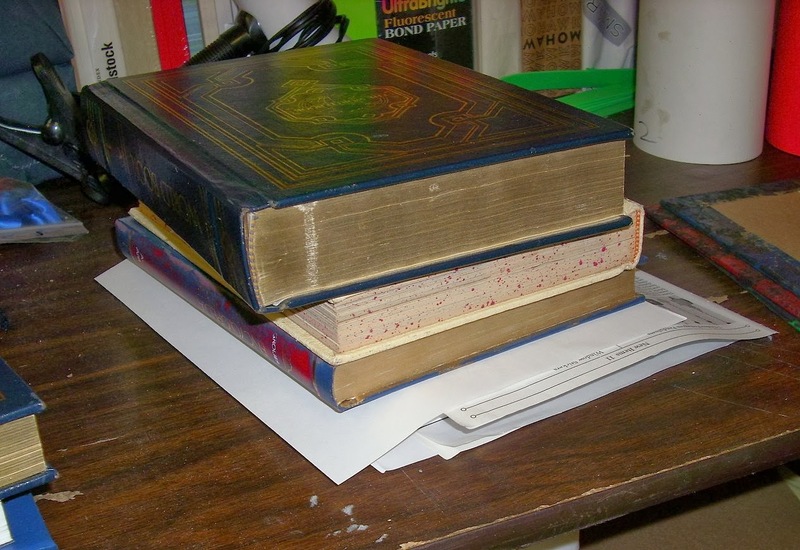 I use encyclopedias, or other large books, as weights. 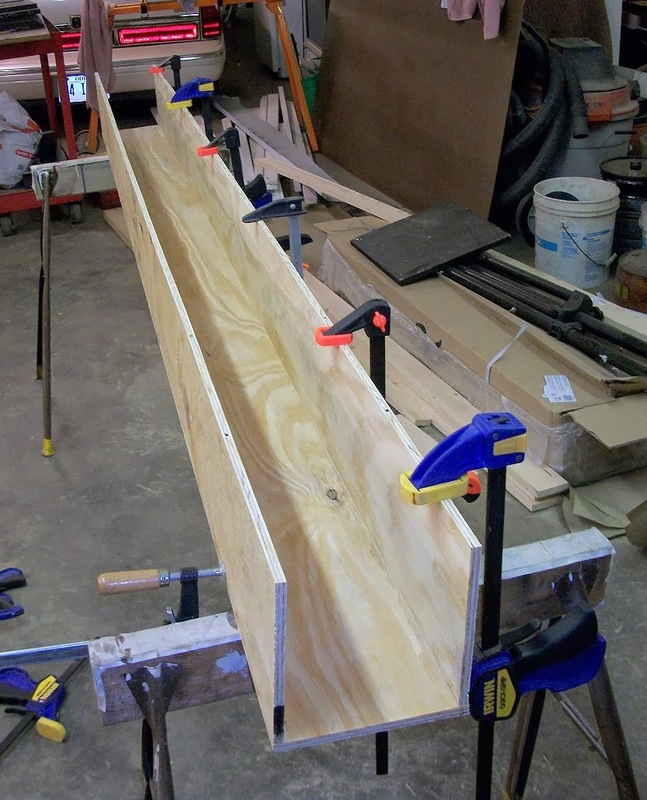 Once it is dry, you will need to trim off that overhang. I use a snap-off razor knife for this. I extend the blade out all the way and use the side of the blade to help keep my cut straight. 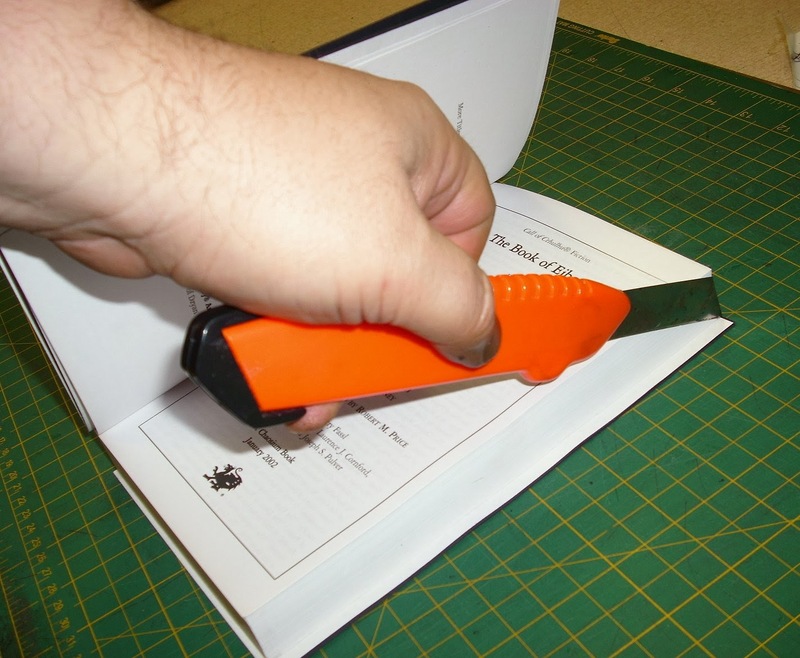 Let the side of the blade ride along the edge of the text block. 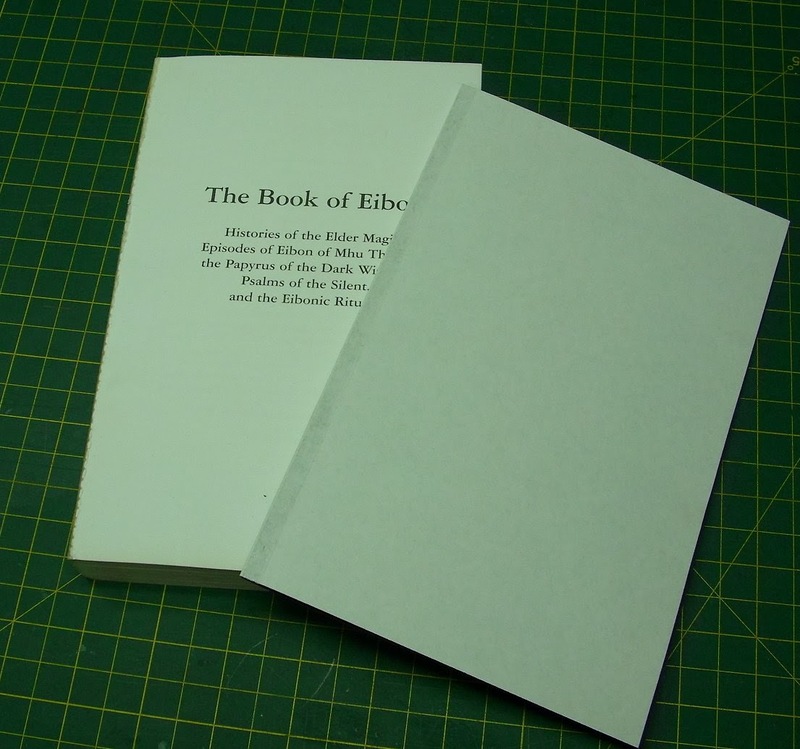 The edge of the text block will serve as a guide to ensure that you cut straight and as close to the text block as possible. Lift up the top signature (which is also overhanging) to get it out of your way, and keep the pages of the text block as straight as possible. Do this on all the overhanging sides. I get much better results when I make the end signatures overhang and then trim them to match the text block, than I do if I try to cut them to size first and then glue them on. Now we are ready to work on the new mull for your paperback book. This step hasn't changed much either since my earlier tutorials, but I have pics, to lets roll with it. I like to use stacked books set on either side of the text block to hold it with the spine facing up. Make sure your spine is clean and as smooth as it can be. Next, prepare your mull. I'm using brown kraft paper (from recycled paper bags) and cheese cloth (the kind that looks like gauze). 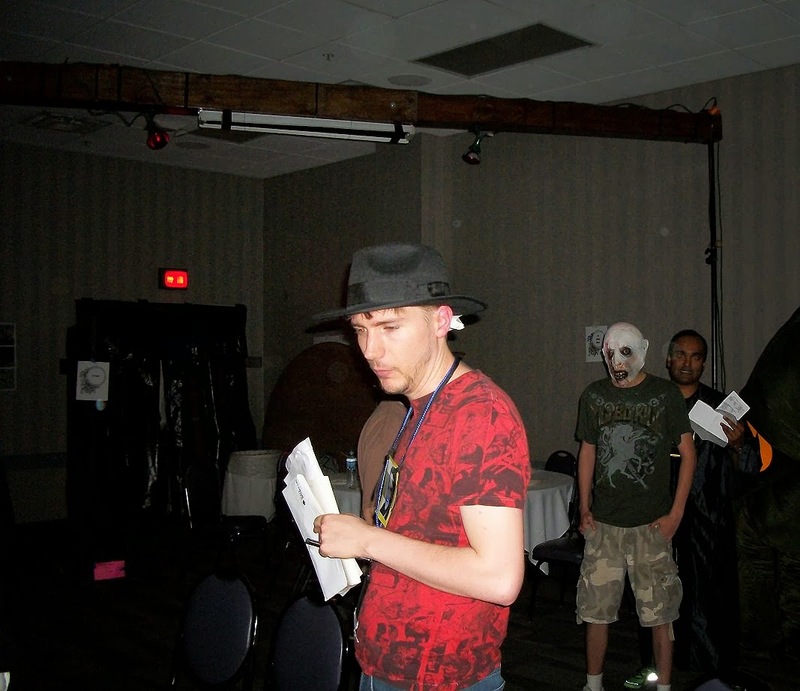 The pic below is from an experiment I did that works, but that I don't prefer. I had made some large sheets of prepped mull by gluing a sheet of cheese cloth to a large sheet of kraft paper, and then I would just cut it to size later as I needed it and then glue it on. It is very convenient, but I don't think it makes for as good a quality mull, as the pva used to glue down the cheese cloth does not completely soften up when the fresh glue is applied. Now I just make it as I need it. But I do like to starch my cheese cloth before hand so it is stiffer and easier to work with. Apply a good quality pva to one side of your kraft paper and lay a piece of cheese cloth over it. I use a foam roller to apply the glue, as it gives me a nice thin and very even coat and it applies much faster and easier than with a brush. Roll some more pva on top of the cheese cloth. Put a medium coat of glue on it. Then trim your paper/cheesecloth so that it is just slightly shorter than the height of the text block and is wide enough to span the spine and come down at least an inch, maybe two, over the end paper. I also like to cut the corners on a taper. You'll see why in a moment. Center your mull over the spine and use your finger and your bone folder to rub the spine, through the kraft paper, to ensure good contact. Wipe up any excess glue that may seep out. 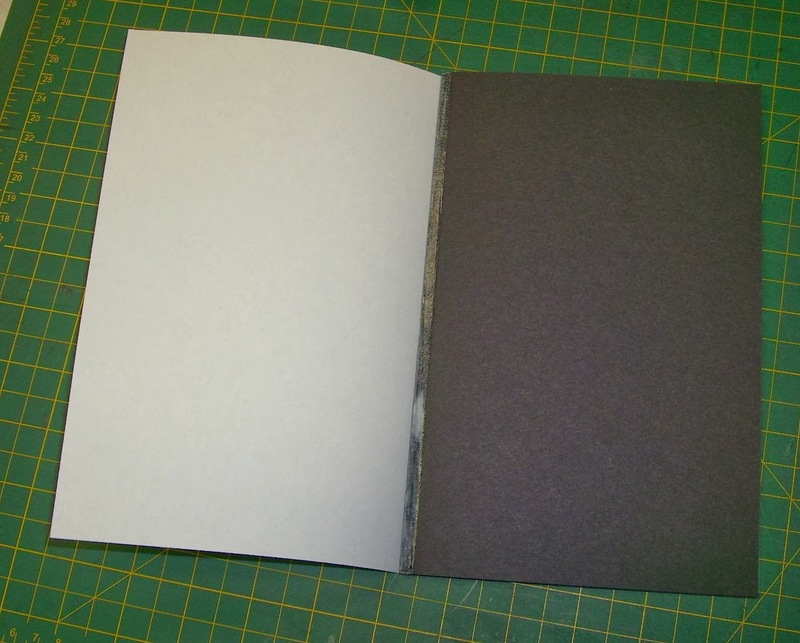 Then use your (clean) hands or bone folder to smooth down the side flaps onto the end papers, adhering it to the white paper of the end paper signatures on both front and back. 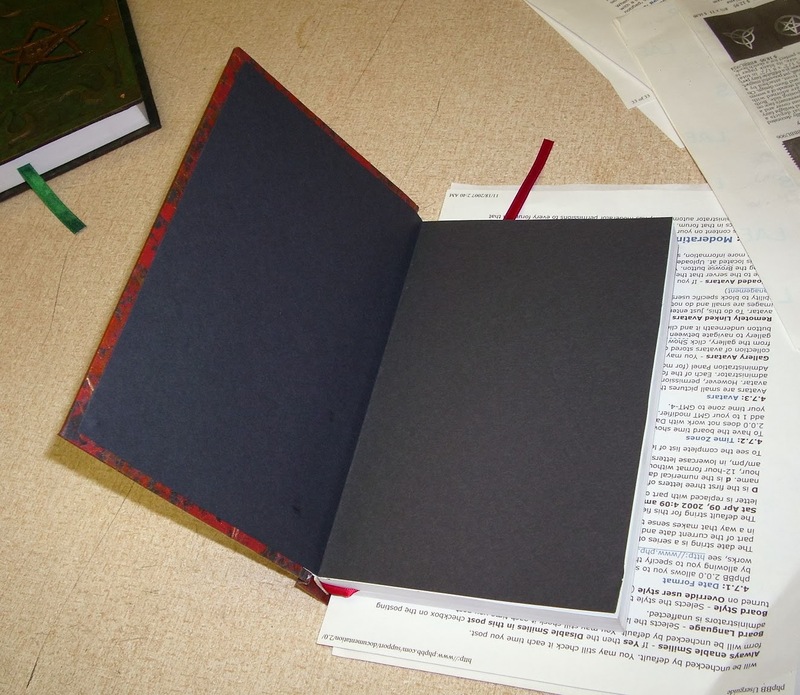 Next, take the text block out of the upright holder and insert blotter pages between the white paper and the end paper of your end paper signatures, front and back. For this, I like to use news print as blotter paper, as it absorbs better than regular copy paper. I also like to use some waxed paper as a moisture barrier. 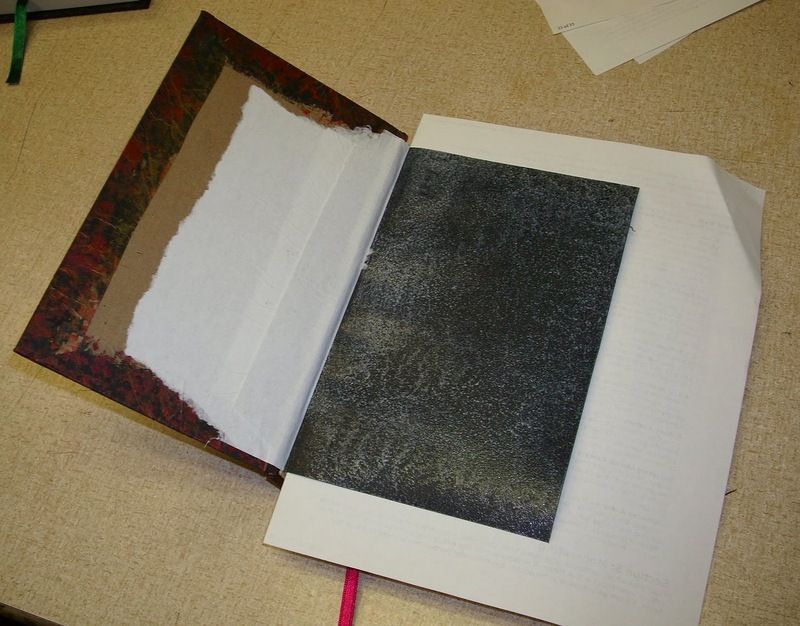 Put your blotter paper near the side with the glue, and your waxed paper behind the blotter to keep any moisture from passing through the blotter on to the end paper. 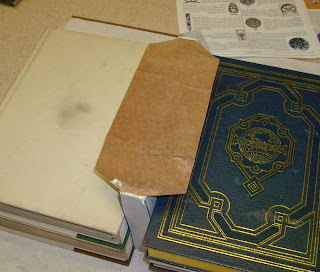 My favorite kind of waxed paper for this purpose is to recycle the backing paper that adhesive labels come on. It has a plastic coating that makes a very good moisture barrier and they are reusable. 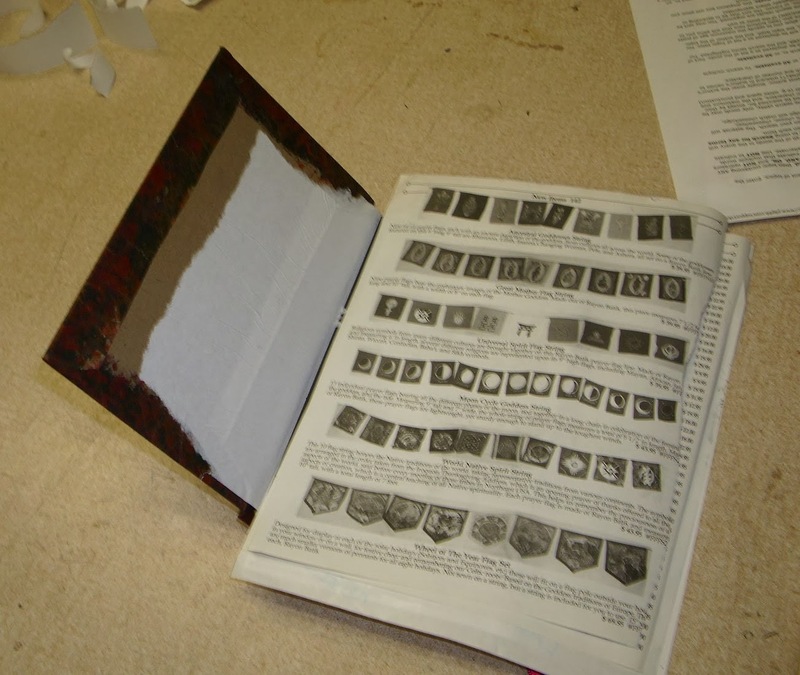 Insert your blotters front and back and then put the text block under weight to dry. 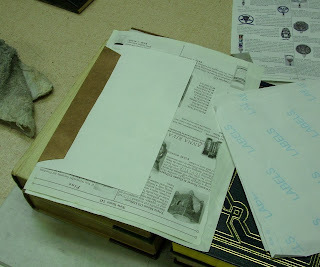 I sometimes use a second page of blotter on top of the glued mull, between it and the weight, to help soak up moisture. The most important part of this process is that you remove as much of the moisture from the drying glue before it can warp your end papers or text block. 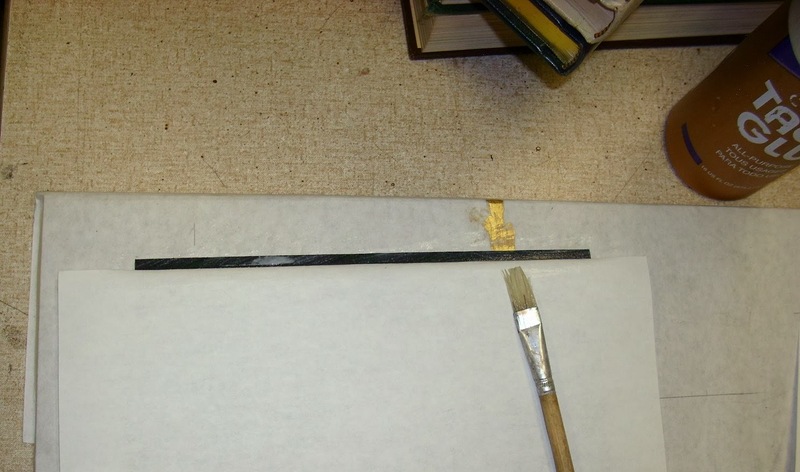 So use a good blotter next to the glue to absorb moisture, and dry under weight to prevent warping. When dry, your text block should look something like this. 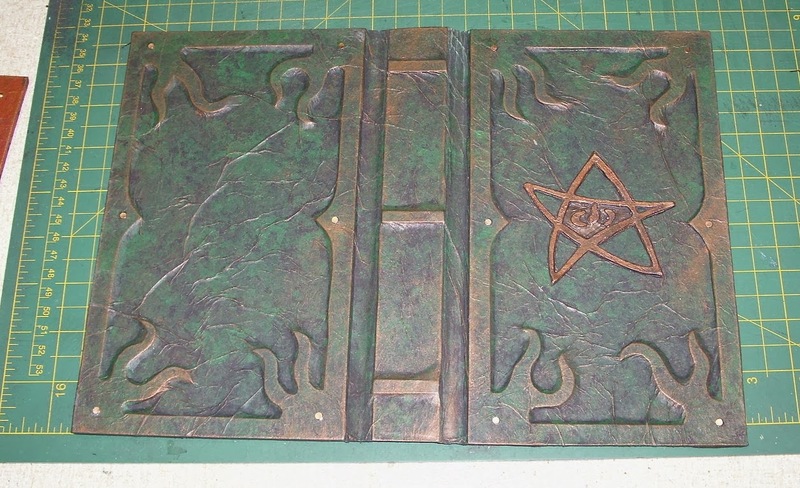 Now we are ready to add the finished hard cover. Tear off the edges of your white paper about an inch or so from the edge. 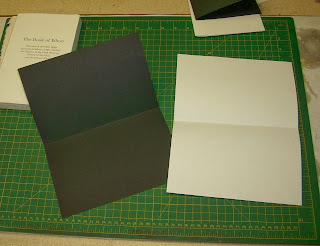 By making the white paper smaller than the back paper, you ensure that you will not be able to see any white peaking around the edge of the black end paper when it is pasted down. 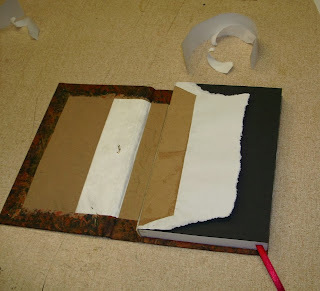 By tearing it rather than cutting it, you deckle the edge, making for a much smoother transition that will not be seen from under the end paper. This is where cutting those corners of the mull on a taper comes in handy. It allows you to get closer to the corner when you tear the white paper. 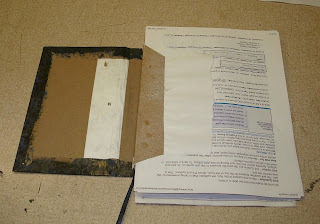 Put a few sheets of scrap paper under the white paper to protect the end paper from getting glue on it, just yet. 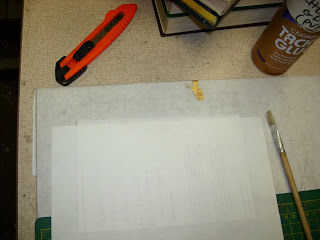 Use a piece of scrap paper on top as a glue shield with at least one sheet of blotter under it, and the waxed paper under that. Line up your text block on the cover boards for the proper fit. Ensure that your square is even all the way around. 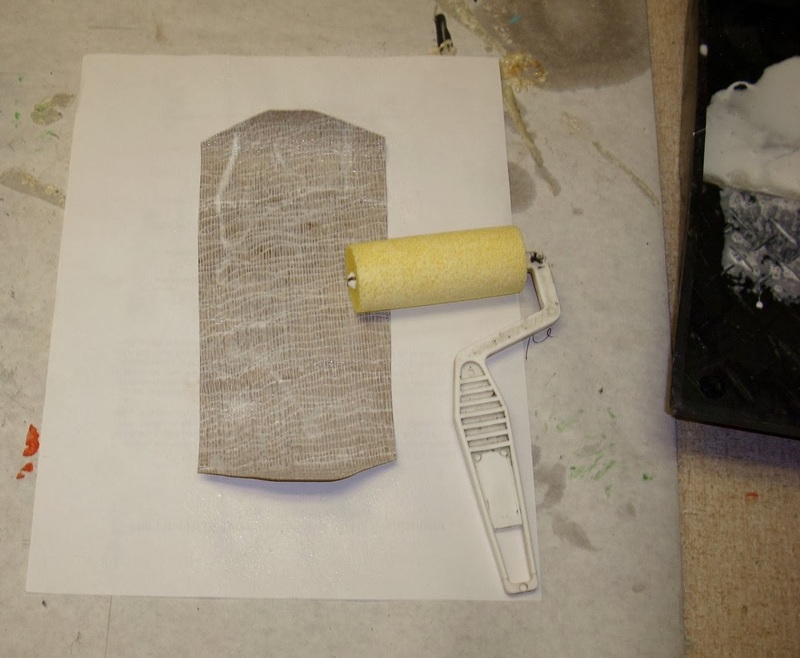 Use the foam roller to apply pva glue to the white paper and attached mull. Use a medium coating on the mull and a lighter coating on the white paper. 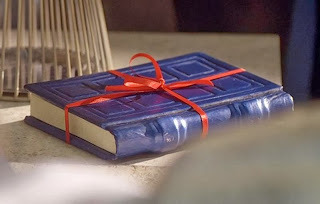 Do not apply glue to the spine, just the side. 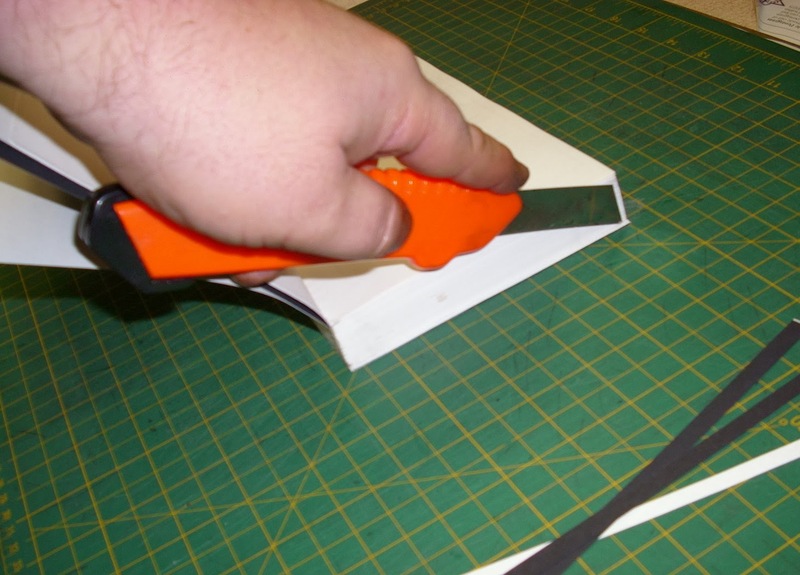 Carefully slide the top sheet of scrap paper out from under the glued white paper. This will leave your blotter as the next sheet, and your waxed paper underneath it. Double check your positioning, then close the case over the text block and press down on it to ensure good adhesion to the glued white paper underneath. Do not try to lift the white paper to smooth it onto the case. Close the case onto the text block. Press down for a few seconds, then lift the cover carefully. Don't open it all the way. Just open it about half way (pointing straight up), enough that you can use your clean hand to smooth out the white paper against the cover, working from spine to edge. If you didn't over load the white paper, there shouldn't be any excess glue. But if there is, clean it off before closing the cover again. Keep that side of the cover closed. Flip the book over, careful not to move the text block around, and repeat the process on the back cover. Then let dry under weight. Once it is dry, you can remove the blotter and waxed pages and it should look like the picture below. Now comes the final step. Pasting down the end paper. Again, make your stack of scrap paper, blotter and then waxed paper, and place it under the end paper. 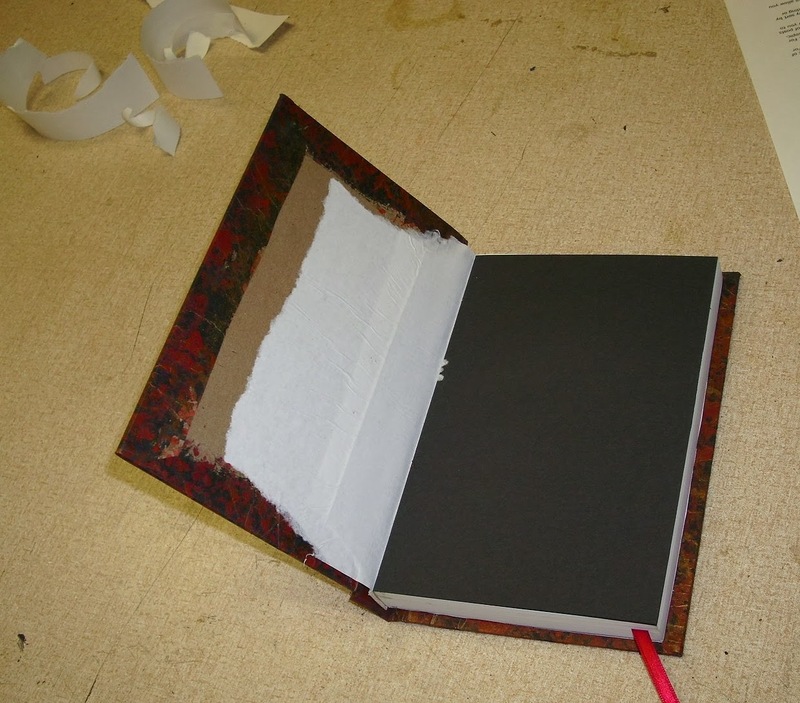 Apply a very thin and even coat of pva glue, to the end paper, with a foam roller. You can use a brush, but I like the roller. Slide the scrap paper off the top of the stack, leaving the blotter and waxed paper. Again, gently close the cover over the text block; Do not lift the end paper up to the cover. Press down to get good adhesion. 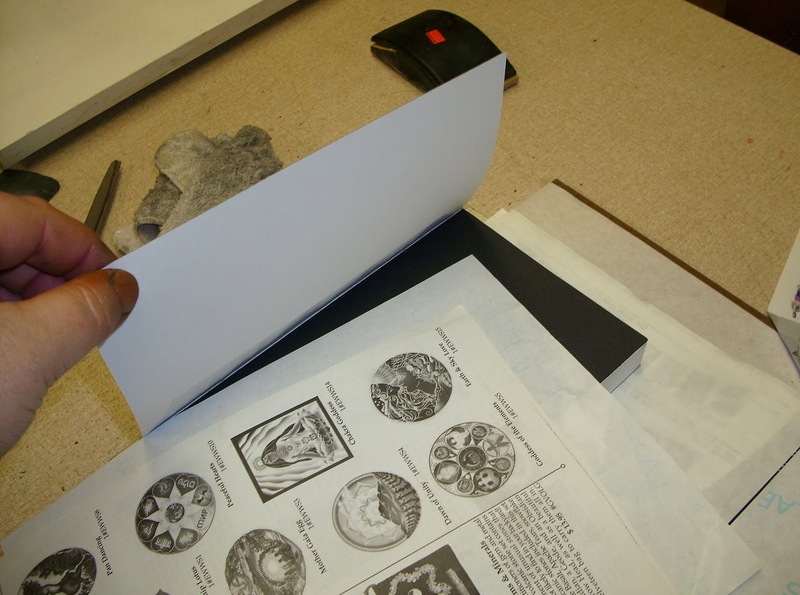 Then, just like before, lift the cover half way and smooth the end paper down with your hand, ensuring good adhesion to the cover. 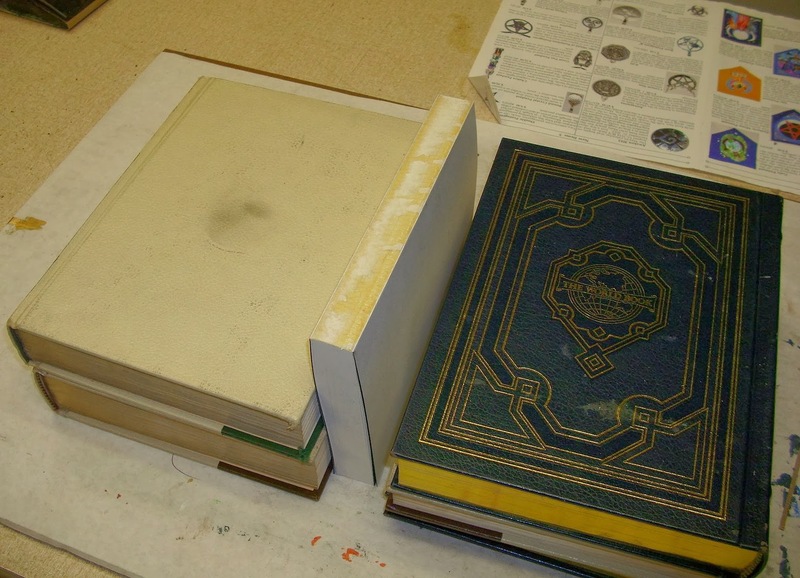 Re-close the cover, flip the book over and repeat on the other side. Allow to dry under weight. If you are using a thin coat of glue your drying times should not be more than an hour or so. In previous posts I advocated using a spray on adhesive to paste down the end papers, as it was instantly dry (contact cement) and added little moisture. However, I have found that it too has poor archival qualities and can break down. Now I use a roller to apply a thin even coat of pva to past down my end papers. Once it is dry, you are finished. You should have a nice smooth and wrinkle free end paper and one extra white leaf added to the front (and back) of the text block. So there it is, my double end paper technique to avoid wrinkles. I hope you liked it. If you are using this technique and are still having trouble with wrinkling, try using two sheets of news print as blotter and try putting your glue on thinner (or switching to a glue with less water in it). Now go make some books! 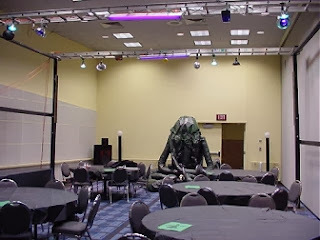 Since 2001, my gaming group Rogue Cthulhu has used special effect lighting in our game room at Origins. To hold all the lighting equipment overhead, I constructed a custom lighting rig, which consisted of four telescoping upright posts and two 20 foot long sections of an aluminum ladder. It has undergone a few modifications to improve its stability over the years, but it has essentially remained unchanged since it was first built. Like any system, it has its drawbacks. The fact that all four posts have to be raised and lowered simultaneously was a big one. Also, those ladders are difficult to store and transport, and they don't provide any adjustability. I've been telling myself for years that I was going to build something better, but cost, portability, weight, and simplicity kept bringing me back to the same design. This year I finally made some progress on improving the RC light rig- starting with getting rid of those damned ladders. While it's hard to beat aluminum for its strength to weight ratio, the ladders were really overkill in the strength department. They are capable of holding several hundred pounds of load, while we only really needed to use about fifty pounds of cords and lights. I looked at several (many, many) material and design options to replace the ladders. 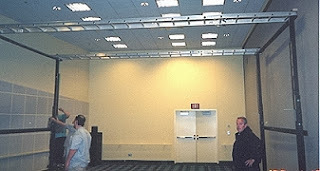 I needed something lightweight, easily portable (probably modular with sections no longer than 8-10ft), durable, cheap to build- requiring no equipment or skills to which I did not have access, and able to span 20+ feet with no center support. That last one was the killer. Lots of things can span 10ft. with no problem, even 15ft. if pressed, but 20 or more feet with no center support and you start to have troubles. In order to have the strength to span that distance and hold any kind of load safely, your truss starts to become huge and heavy, and its own weight becomes an issue. 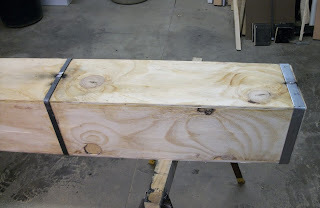 Although I had trouble with using wood as a material for the upright posts (warping, splintering, etc. ), it gave me the best strength to weight ratio that I could afford. After looking into several truss designs, I decided to make telescoping sections of square tubing out of 3/8in. plywood. The plan was to make several sections of rectangular tubing. Some would be slightly larger and would slide over the others. Each truss would be made from three sections; one outer tube in the middle with one slightly smaller tube coming out each end. The outer tube would have to be completely hollow inside, but the inner tubes could have bulkheads to give them strength and stability without adding much weight. I ripped a sheet of 3/8in. 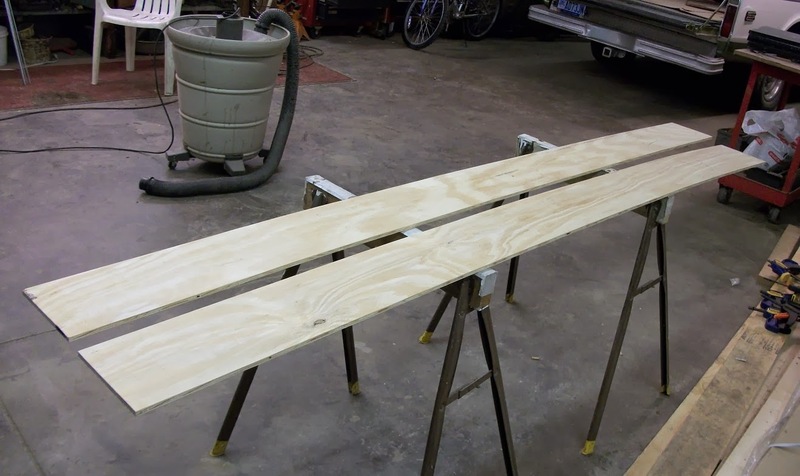 plywood into strips. 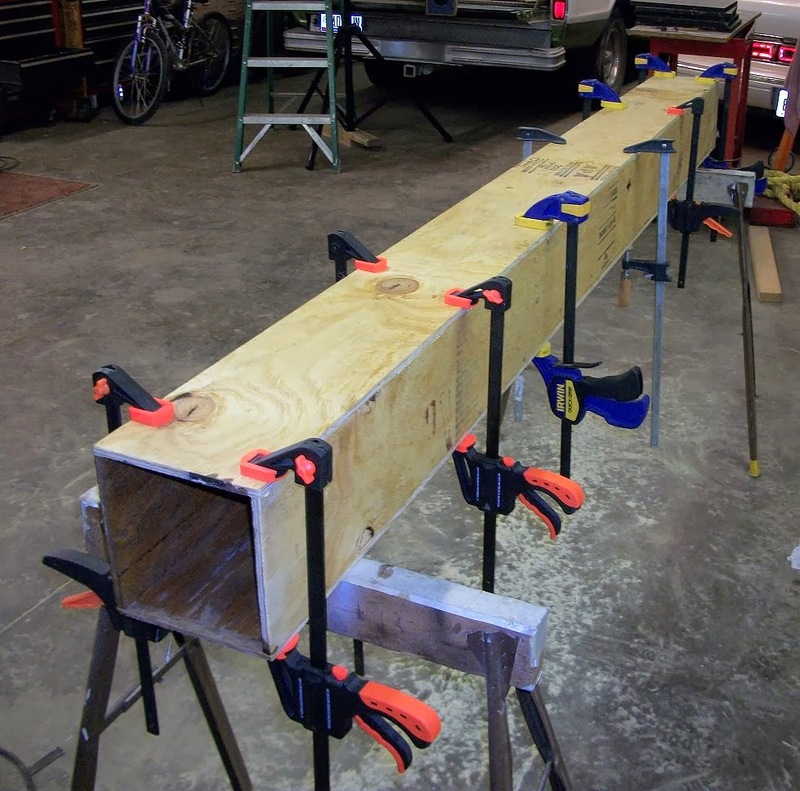 The strips, when put together, would make a box (tube) roughly 6in by 7in by 8 feet. I also cut 5/8in. MDF into rectangular bulkheads to fit inside the smaller tubes. Though I didn't have an immediate need to, I drilled out the centers of the bulkheads because I would never have the opportunity to again. Also, it cut down a little on weight. Five bulkheads were equally spaced along the 8ft. length of the tube. They were glued and stapled in place. A prodigious amount of clamping was done to ensure a tight glue bond. 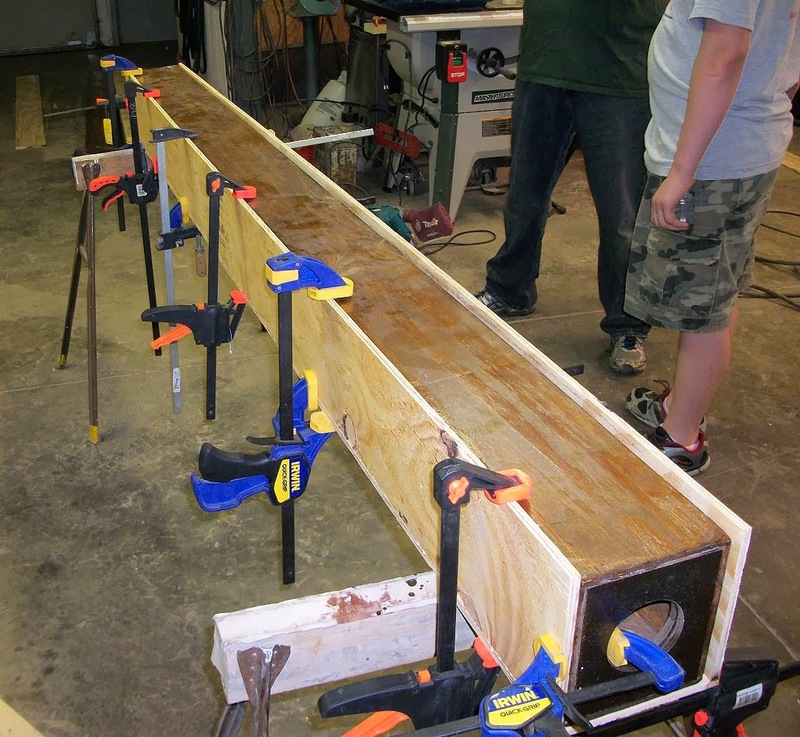 The edges of the plywood, where they came together, were also glued and stapled. For maximum strength, I used a LOT of staples. About one every two inches. Hey, staples are cheap! 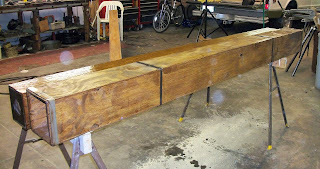 Before the last side was glued and stapled into place, I gave the interior a good coating of stain and polyurethane mix. 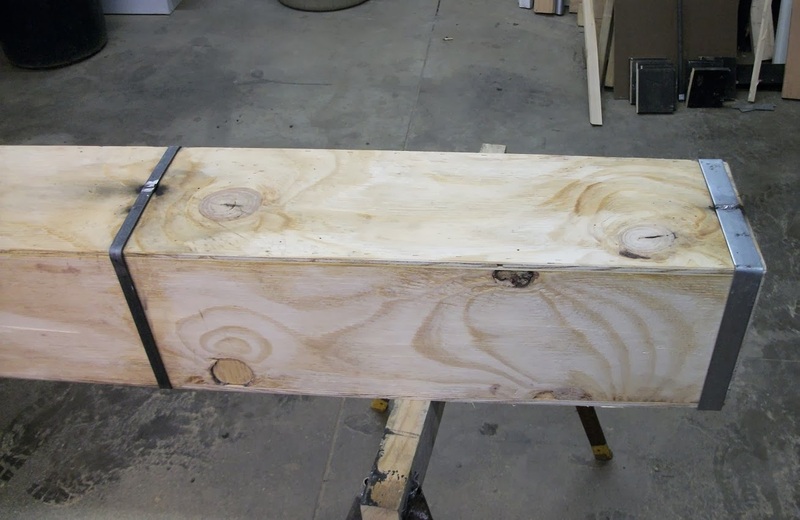 Then, after the last side was in place and the glue dry, I sanded the exterior smooth with a belt sander, making sure to round off the corners to avoid splintering and to give a little clearance at the corners when the sections were fitted together. Since the sections would need to fit together with minimal clearance, and yet slide smoothly, I needed the exterior of the inner tube (and the interior of the outer tube) to be very smooth. After sanding, I gave the exterior two coats of stain and poly mix, sanding between coats. Here are two of the inner tubes finished. One is still waiting to be stained. Putting together the outer tube was a little trickier. The interior of the outer tube had to be nice and smooth, so the strips had to be sanded before assembly. Since it didn't have interior bulkheads to keep the sides square while gluing and stapling, I used one of the inner tubes as a temporary bulkhead. I put some glue along the edges of the boards, then clamped the walls of the outer tube to the sides of the inner tube, got everything square and even and then stapled the crap out of it. I had to be very careful to send the staples in straight. I couldn't have any staples sticking through on the interior side, and I couldn't have any splintering. After the staples were in, I removed the inner tube so I could clean up any glue that smooshed out the seam. I didn't want it to end up gluing the two tubed to each other! This process was repeated for each side, letting them dry before moving on to the next side. When three of the four sides were together, I gave the interior a nice heavy coat of stain and poly mix. Then the fourth side was glued and stapled into place (without the inner tube). I was careful to make the seams as strong as I could, but without interior bulkheads, the outer tube would be too weak to be used the way I wanted. 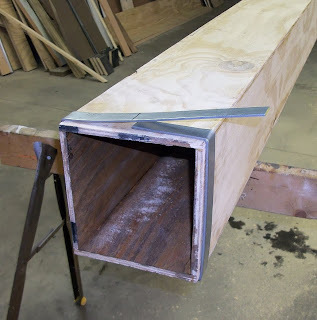 The stress of the inner tubes prying the sides apart at the ends as the load bore down on the center of the truss would be far more than the glue and staples along a 3/8in. edge could safely handle. 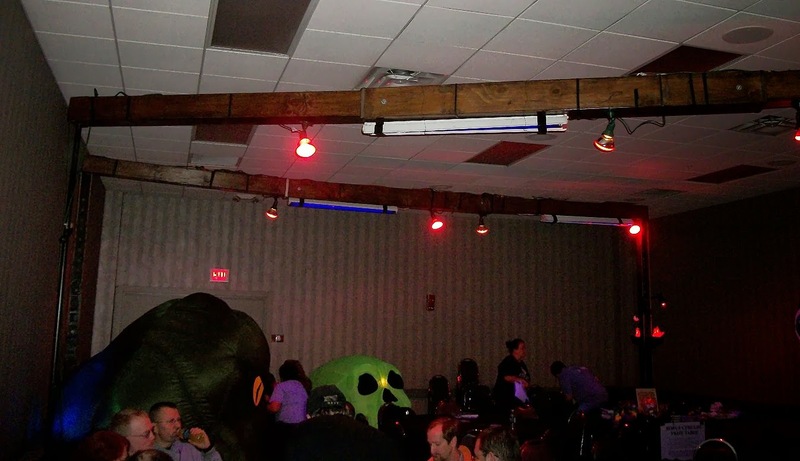 And since this thing would be holding lighting over the heads of dozens of people, it needed to be reinforced. I accomplished this be using steel strips to bind around the outside of the tube, like the rings of a wooden barrel. The steel flat-stock was bent at right angles in a vise, then taken over to the work piece and measured for fit before the next angle was bent. This was repeated until the steel wrapped all the way around the tube, very snugly. The steel was cut so the ends would just meet and then they were welded together while being clamped tightly to the tube. I wouldn't have been able to do this last part a few years ago. I just learned how to use a MIG welder at my current day job. I'm no professional welder, but I get by. I put four steel bindings on the outer tube. One at each end, and one more about two feet from each end. When the inner tubes stick into the ends of the outer tube, they will only go in about two feet. 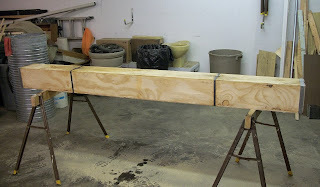 That will put most of the stress from the cantilever action on the seams at this two foot section at the end. 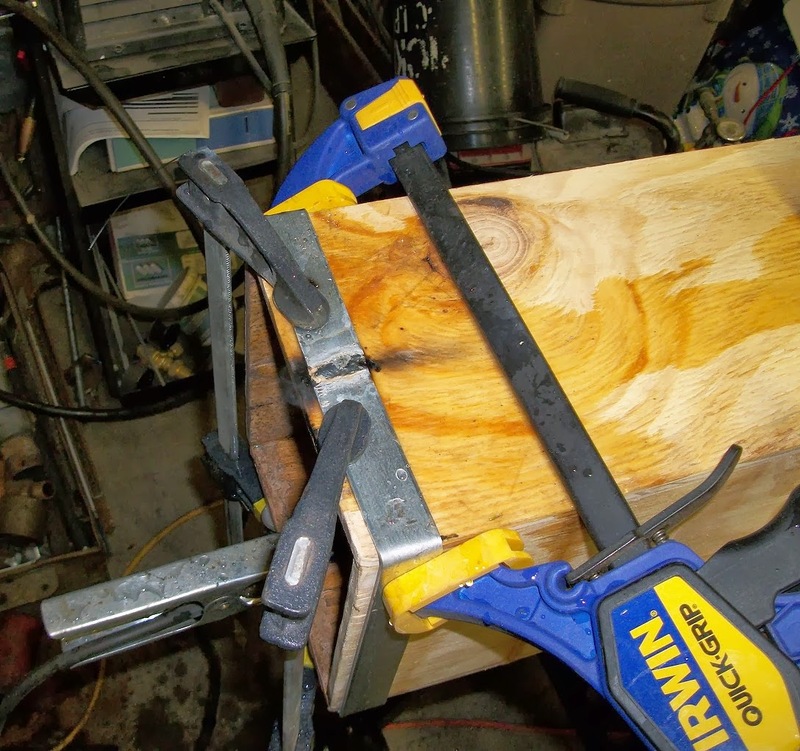 With two steel bindings at each end, it should have no trouble holding together under that stress. I did a stress test with a scrap outer tube (I glued the wrong sides together) without any steel bindings. It held up over a hundred pounds of dead weight, but started to crack when I stood on it (300lbs.). After the bindings were in place, I gave the exterior two coats of stain and poly mix. I wanted to have every part of the truss stained and polyed not only for looks, but for smoothness and to help prevent warping. 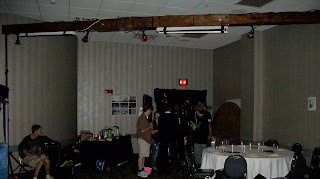 Here is the full length truss being held aloft by two DJ lighting rig stands that I bought off of eBay. 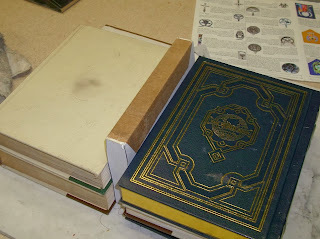 The center section is not stained or bound with steel (it was the scrap one that I glued wrong). With two feet of overlap at each section joint, the overall length is 20ft. I can push it to 22ft if I only overlap 12 inches, but that's as far as I think I should go. As you can see in the photo, there is no deflection at full extension without a load. I made two of these trusses, to replace the two ladder sections. 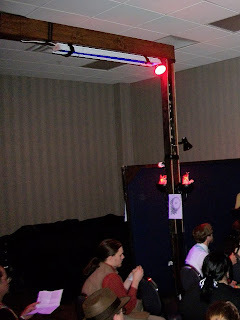 For their implementation at Origins 2013, I put one of them on the old telescoping uprights and one on a pair of new DJ lighting stands I bought on eBay, and then modified (more on them in another post). You can see a slight deflection in the picture below, but that is not due to the weight. That is due to the 1/8in. gap between the large and small tubes. It was hard to cut and fit the pieces together under tight tolerance, and I was afraid to make them fit together any tighter, for fear that future swelling and warping might make them not fit together or slide properly. 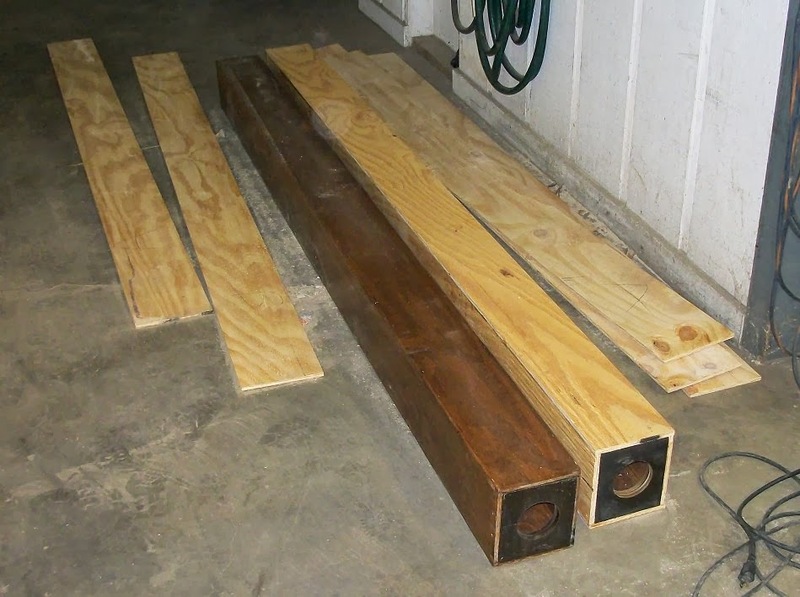 Once the pieces were slid together on site, laying on the floor, I drilled through both outer and inner tubes simultaneously and pinned them together with a piece of all-thread and some nuts and washers at each end. 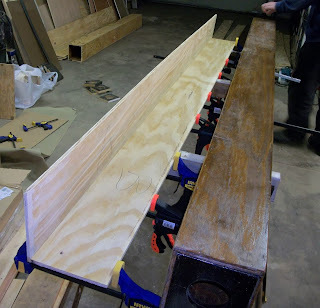 I was going to pre-drill a bunch of holes along the length so it would be adjustable but decided it would be easier to just re-drill holes at whatever position I wanted on site. When it gets full of holes and hard to line up properly (in 10-12 years, I can always re-make them. 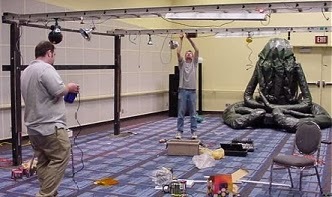 The lights were held up with mechanic's wire wrapped around the girth of the truss. 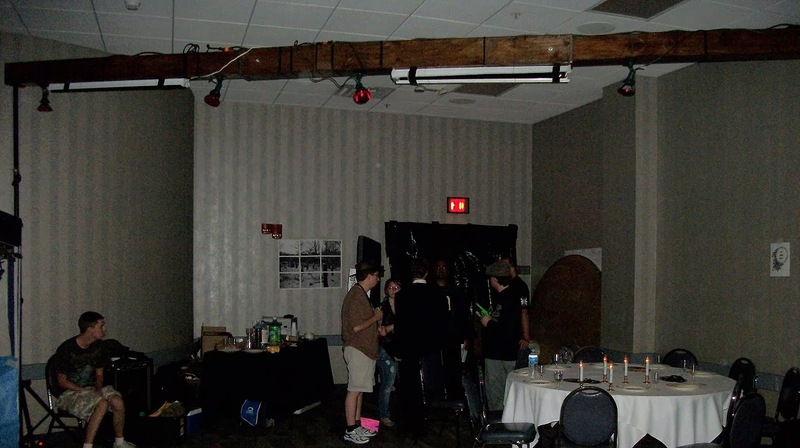 The electrical cords were taped up with vinyl electrical tape. 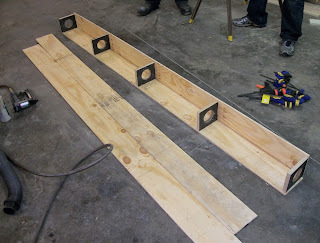 I did drill out more holes in the old uprights to make them more adjustable for height. Now that Club Carcosa is over, we only use about 25 pounds of lights and cords on each truss. These trusses can hold more than four times that amount, so we have lots of room to expand our effects repertoire, and a stable platform on which to mount it. 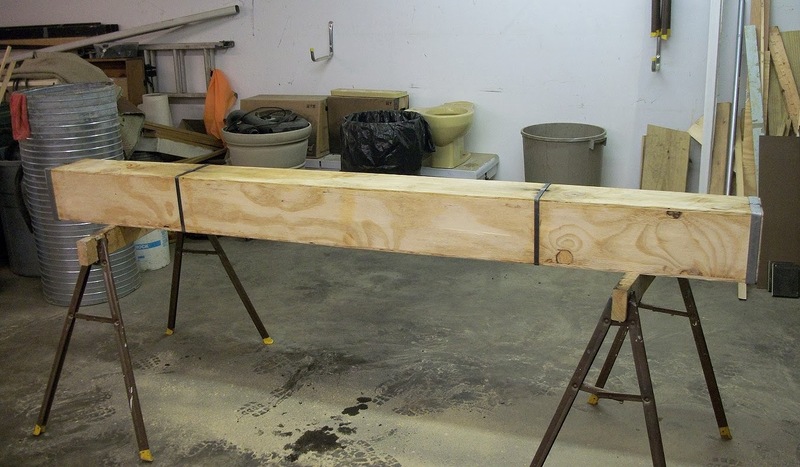 The truss sits on top of the uprights without being clamped down. 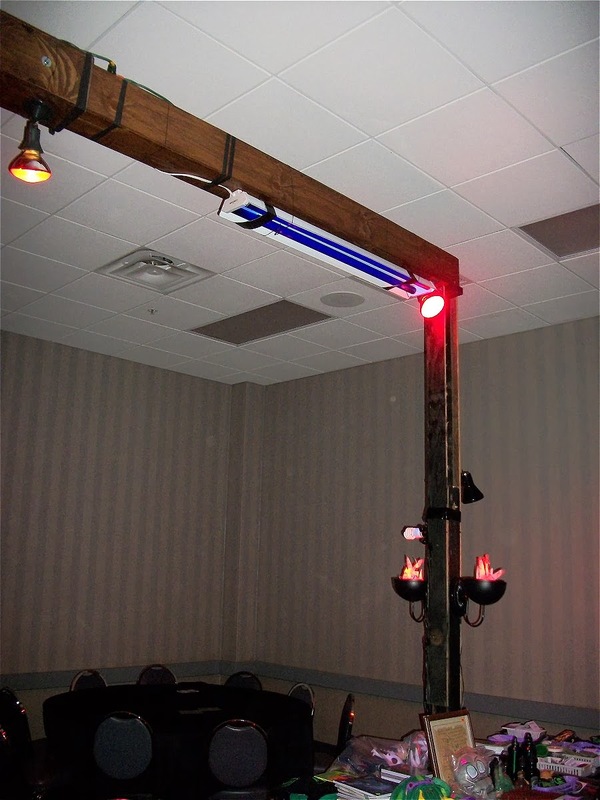 The wide base of the truss allows it to sit flat on the top of the post with no worry of twisting. The truss has a hole drilled in the bottom near the end which rides on a pin made from a 1/2in. bolt, which sticks up from the top of the upright, about 3in. 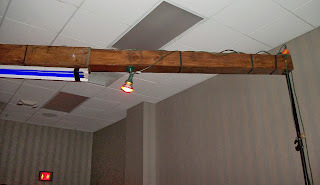 In order for the truss to fall or slide in any direction (other than straight up), it would have to jump straight up more than 3 inches. I figure, if it does that, we've got bigger problems! And I can always put in a strap or something to keep it from moving in that direction. 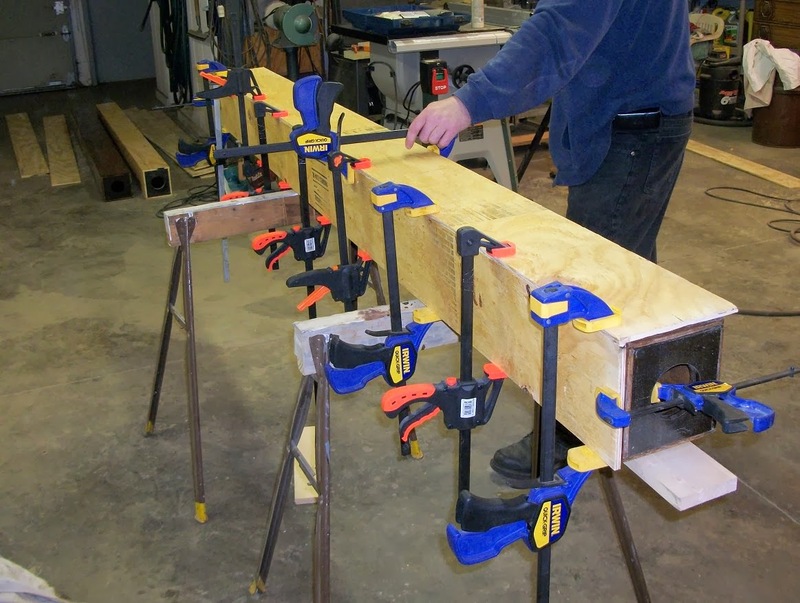 The sits-on-pin design means that the truss doesn't need to be clamped down. Since it can float on the pin to some degree, the two uprights can be raised and lowered independently (or at least they don't have to track perfectly with each other like they did before). 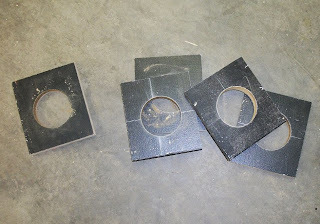 Also, one of the modifications I made to the uprights was to put bigger bases on them, so they would be more stable without having to have all four joined together. 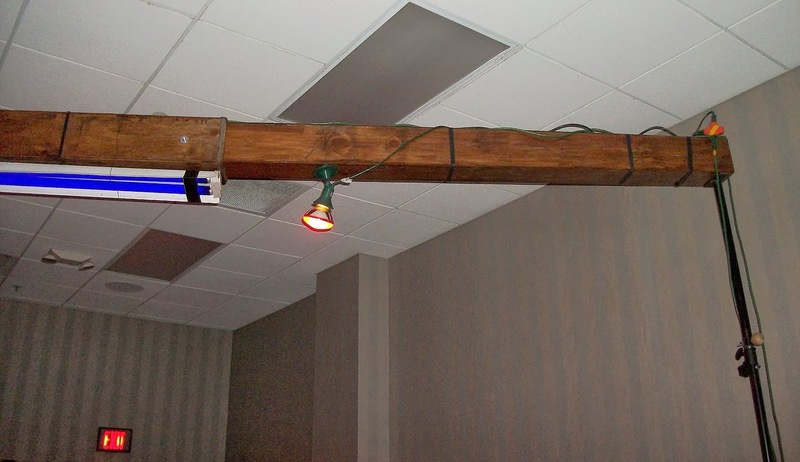 This allows us to move the two trusses farther apart or put them at odd angles, and allows us to raise and lower them independent of each other. That's a big improvement over the previous design. 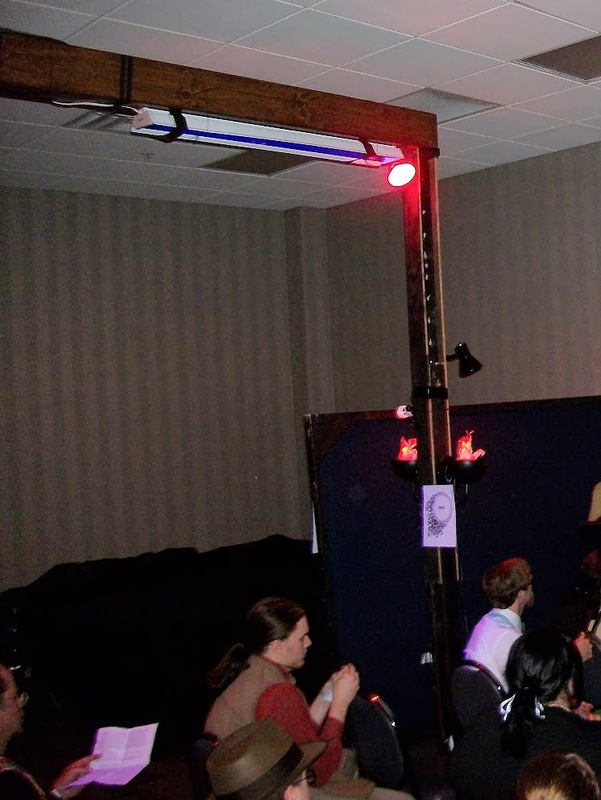 During Origins, we extended the new trusses to 22ft, and they seemed quite stable and safe, and were much easier to work with than the ladders. Sadly, the new DJ stands didn't work as well as I had hoped and the old uprights I had build out of 2x4s ten years ago actually worked better than the new manufactured steel ones. The trusses are a bit lighter than the ladders, but not as light as I wanted. They do, however, transport much easier. Each section, truss and upright, is no more than 8ft. long, so they all neatly fit inside the bed of a full sized pick-up truck.And two of the truss sections can be nested inside one another to conserve space.